Relive the days when Travel was an exciting adventure. Enjoy the sights and sounds, relax, and arrive with a smile. 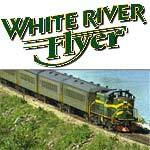 Come aboard a Vermont Flyer Train today.